This is a good, local crag for a quick winter pump. The crag faces due southwest, high on a hillside and bakes all afternoon. The best time to climb there is winter. Drive 4 miles up Frying Pan Road from Basalt and Park in the large lot on your right just after crossing the Taylor Creek bridge. Walk back across the bridge and up the road that goes towards the cliffs. After several minutes, the road will veer left at a grassy area. Cross the creek and pick up a trail on the opposite side that parallels the road, heading up the valley. 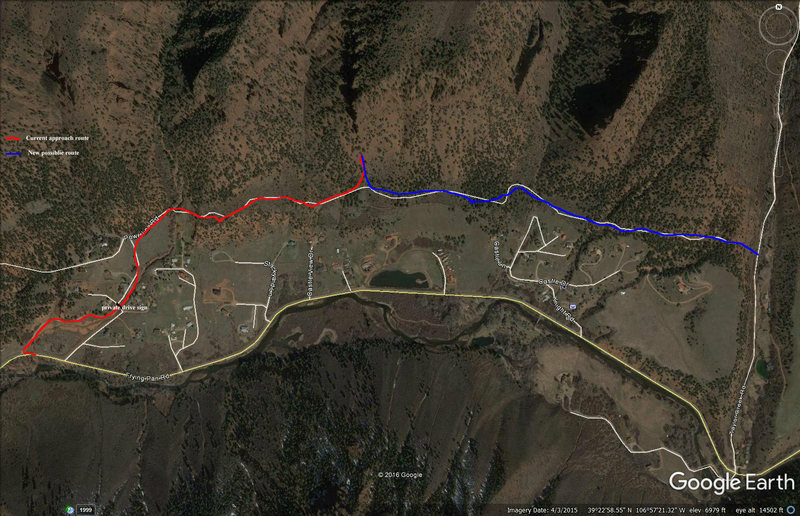 Follow this for a ways until you come to a game/ hiking trail on the left. If you come to a power line tower in field you have walked too far. Make a left, angling back north under the nose of the center castle. The crag sits around on the southwest side. Please respect home owners on the approach. From B. James: "Just to clarify on the description after getting lost on the approach the other day. This crag is on the "center castle" or the the 3rd formation from the left when looking up valley. When following the trail that parallels the road for "a ways" the actual distance is about 1mi from the parking lot so plan accordingly. The crag is directly above a small pond visible from frying pan rd. The approach up from the walking trail is heinous hand over hand small scree slogging, without much of a flat spot to set up a belay." Possible route to access Seven Castles and not cross private property.